I went to a gala and they were serving raspberry rose gelato. It was amazing and of course the first thing that came to my mind was that I have to make this at home. I used my quick no-churn ice cream base and added fresh raspberries and rose water. The result was a beautiful luxurious raspberry ice cream with a hint of rose. In a small sauce pan, add half of the raspberries, Chambord, and icing sugar. Bring to boil and then lower heat and simmer for 5 minutes. Raspberries should be broken down into a sauce. Stir occasionally. Let cool. In a large bowl, whip the cream into soft peaks. Add the condensed milk slowly until incorporated. Add rose water. Once the raspberry sauce is cooled, strain to remove the seeds and pulp. Add the rest of the raspberries to the sauce and stir gently as not to break up the raspberries. Fold raspberry mixture into the cream just until incorporated creating a raspberry swirl in the cream. Pour into a freezer safe plastic container with lid. Freeze overnight. Take out of freezer 10 mins. before serving to soften slightly. 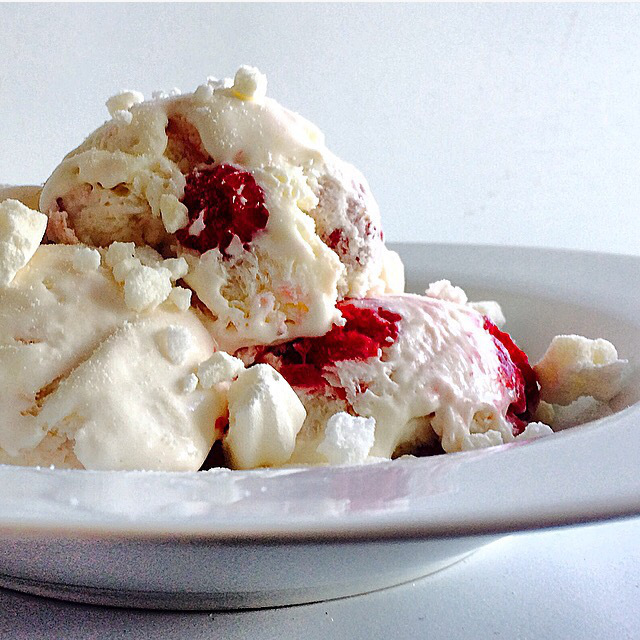 Sprinkle crushed meringues over ice cream and serve. I love using Chambord in this ice cream. It’s a raspberry liquor made from brandy. It has an intense, sweet, jammy, raspberry flavour that works perfectly with this dessert. But if you don’t want to use alcohol, you can always substitute raspberry jam. Just don’t add the icing sugar.